از نگرانی‌های اصلی آلودگی‌های دارویی حضور آنتی‌بیوتیک‌ها در منابع آبی و فاضلاب است که سبب مقاومت میکربی و افزایش مقاومت دارویی در انسان و جمعیت میکروب‌های بیماریزای محیط زیست می‌شود. هدف از این مطالعه بررسی کارایی فرایند اکسیداسیون پیشرفته (H2O2/ZnO) در حذف آنتی‌بیوتیک سفتریاکسون از محیط‌های آبی می‌باشد. این مطالعه به روش تجربی انجام گرفت. اندازه نانو ذره اکسید روی با استفاده از روش‌های SEM، XRD وTEM آنالیز شد. پارامترهای مؤثر بر فرایند اکسیداسیون از جمله pH (3، 7 و 11)، نسبت مولی H2O2/ZnO (1، 5/1 و 3)، غلظت اولیه سفتریاکسون (5، 10 و 15 میلی‌گرم در لیتر) و زمان تماس (30، 60 و 90 دقیقه) بررسی شد. 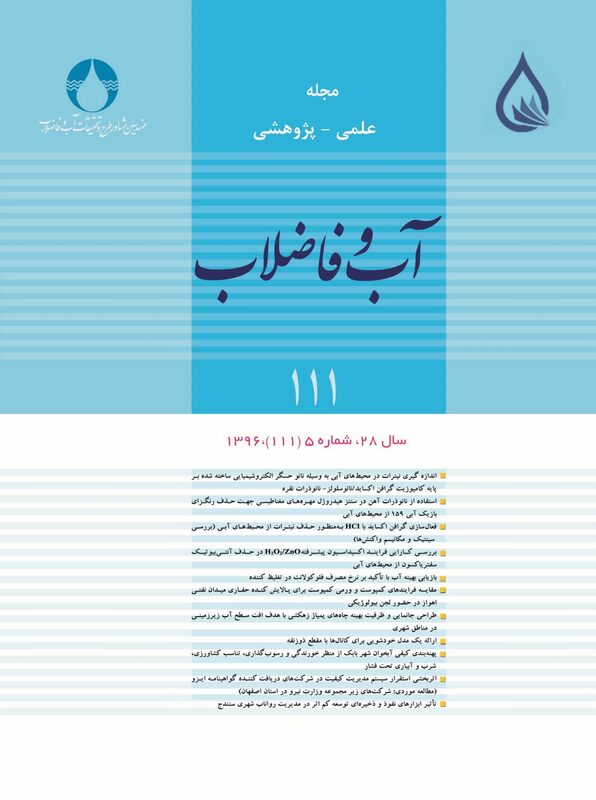 در این مطالعه از روش آنالیز آماریSPSS (آزمونANOVA) استفاده شد. یافته‌های حاصل از XRD ساختار کریستالی هگزاگونال نانو ذرات اکسید روی را نشان داد، تصویر TEM کروی بودن این نانو ذرات را تأیید کرد و نتایج حاصل از تصویر SEM نشان داد که اندازه نانو ذره روی در این مطالعه کمتر از 30 نانومتر است. نتایج نشان داد که درpH بهینه برابر با 11 و زمان تماس 90 دقیقه و نسبت مولی H2O2/ZnO برابر 5/1، کارایی حذف آنتی‌بیوتیک سفتریاکسون 92 درصد می‌باشد. با توجه به یافته‌های این تحقیق فرایند اکسیداسیون پیشرفته H2O2/ZnO از قدرت بالایی در حذف آنتی‌بیوتیک سفتریاکسون از محلول‌های آبی برخوردار است. A major concern about pharmaceutical pollution is the presence of antibiotics in water resources through their release into sewers where they cause bacterial resistance and enhanced drug-resistance in human-borne pathogens and growing microbial populations in the environment. The objective of this study was to investigate the efficiency of the advanced H2O2/ZnO oxidation process in removing ceftriaxone from aqueous solutions. For this purpose, an experimental study was conducted in which the SEM, XRD, and TEM techniques were employed to determine the size of Zinc oxide nano-particles. Additionally, the oxidation process parameters of pH (3-11), molar ratio of H2O2/ZnO (1.5-3), initial concentration of ceftriaxone (5–15 mg/L), and contact time (30-90 min) were investigated. Teh data thus obntained were subjected top statistical analysis using the SPSS (ANOVA test). XRD results revealeda hexagonal crystal structure for the nano-ZnO. TEM images confirmed the spherical shape of the nanoparticles. Finally, SEM images revealed that the Zn nanoparticles used in this study were less than 30 nanometers in diameter. Based on the results, an optimum pH of 11, a contact time of 90 minutes, and a H2O2/ZnO molar ratio equal to 1.5 were the optimum conditions to achieve a ceftriaxone removal efficiency of 92%. The advance H2O2/ZnO oxidation process may thus be claimed to be highly capable of removing ceftriaxone from aqueous solutions. Adams,C.,Wang, Y., Loftin, K. & Meyer, M., 2002, "Removal of antibiotics from surface and distilled water in conventional water treatment processes", Journal of Environmental Engineering,128(3), 253-260. Al-Momani, F., Touraud, E., Degorce-Dumas, J., Roussy, J. & Thomas, O., 2002, "Biodegradability enhancement of textile dyes and textile wastewater by VUV photolysis", Journal of photochemistry and Photobiology A: Chemistry, 7(1), 153-191. Arsene, D., Musteret, C.P., Catrinescu, C., Apopei, P., Barjoveanu, G. & Teodosiuc, C., 2011, "Combined oxidation and ultrafiltration processes for the removal of priority organic pollutants from wastewaters", Environmental Engineering and Management Journal, 10(12), 67-76. Chatzitakis, A., Berberidou, C., Paspaltsis, I., Kyriakou, G., Sklaviadis, T. & Poulios, I., 2008, "Photocatalytic degradation and drug activity reduction of chloramphenicol", Water Research, 42(1), 386-394.
deAbreu, P., Pereira, E.L. & Campos, C.M.M., 2012, "Photocatalytic oxidation process(UV/H2O2/ZnO) in the treatment and sterilization of dairy wastewater", Acta Scientiarum Technology, 35(1), 75-81. Ding, C. & He, J., 2010, "Effect of antibiotics in the environment on microbial populations", Applied Microbiology and Biotechnology, 87(3), 925-941. Elmolla, E.S. & Chaudhuri, M., 2010, "Degradation of amoxicillin, ampicillin and cloxacillin antibiotics in aqueous solution by the UV/ZnO photocatalytic process", Journal of Hazardous Materials, 173(1), 445-449. Ghaly, M.Y., Ali, M., Österlund, L., Khattab, I.A., Badawy, M.I. & Farah, J.Y., 2014, "ZnO/spiral-shaped glass for solar photocatalytic oxidation of reactive red 120", Arabian Journal of Chemistry, 5(1), 322-329. Goldman, J.D., White, D.G. & Levy, S.B., 1996, "Multiple antibiotic resistance (mar) locus protects Escherichia coli from rapid cell killing by fluoroquinolones", Antimicrobial Agents and Chemotherapy, 40(5), 1266-1269. Hadi, S.R. & Ebrahimzadeh Namvar, A., 2011, "Antibiotic resistance in bacteria isolated from urban sewage and hospital in Hamadan", Health and Environment, 18(3), 105-114. Hirsch, R., Ternes, T., Haberer, K. & Kratz, K-L., 1999, "Occurrence of antibiotics in the aquatic environment", Science of the Total Environment, 225(1), 109-118. Homem,V. & Santos, L., 2011, "Degradation and removal methods of antibiotics from aqueous matrices–a review", Journal of Environmental Management, 92(10), 2304-2347. Hou, J. & Poole, J., 1971, "β‐lactam antibiotics: Their physicochemical properties and biological activities in relation to structure", Journal of Pharmaceutical Sciences, 60(4), 503-532. Jones, O.A.,Voulvoulis, N. & Lester, J.N., 2003, "Potential impact of pharmaceuticals on environmental health", Bulletin of the World Health Organization, 81(10), 768-769. Javid, A., Nasseri, S., Mesdaghinia, A., Mahvi, A., Alimohammadi, M. & Aghdam, R.M., 2013, "Performance of photocatalytic oxidation of tetracycline in aqueous solution by TiO2 nanofibers", Journal of Environmental Health Science and Engineering, 11 (24), 2-6. Kümmerer, K., 2009, "Antibiotics in the aquatic environment–a review–part I", Chemosphere, 75(4), 417-434. Kusic, H., Koprivanac, N. & Srsan, L., 2006, "Azo dye degradation using fenton type processes assisted by UV irradiaton: a kinetic study", Journal of Photochemistry and Photobiology A: Chemistry, 181(2), 195-202. Larsson, D. J., 2014, "Antibiotics in the environment", Upsala Journal of Medical Sciences, 12(2), 108-119. Ledakowicz, S., Solecka, M. & Zylla, R., 2001, "Biodegradation, decolourisation and detoxification of textile wastewater enhanced by advanced oxidation processes", Journal of Biotechnology, 89(2), 175-184. Loures, C.C., Alcântara, M.A., IzárioFilho, H.J., Silva, F.T. & Paiva,T.C., 2013, "Advanced oxidative degradation processes: Fundamentals and applications", Int. Rev. Chem. Eng., 5(2), 102-120. Mesdaghinia, A.R., Farrokhi, M., Nasseri, S. & Yazdanbakhsh, A.R., 2004, "Biodegradation enhancement of 2,4,6 trichlorophenol (TCP) by fenton oxidation process", Journal of Hakim Scientific, 7(2), 33-42. Mirzaee, A. & Gharbani, P., 2014, "Degradation of aqueous solution of 4-Chloro-2-Nitrophenol in nano-TiO2/H2O2 system", International Journal of Nano Dimension, 5(1), 77. Modirshahla, N., Behnajady, M.A. & JangiOskui, M.R., 2009, "Investigation of the efficiency of ZnO photocatalyst in the removal of p-Nitrophenol from contaminated water", Iran Journal of Chemical Engineering, 28(1), 8-19. Mohabansi, N., Patil,V. & Yenkie, N., 2011, "A comparative study on photodegrada‐tion of methylene blue dye effluent by advanced oxidation process by using TiO2/ZnO photocatalyst", Rasayan Journal of Chemistry, 4(4), 814-819. Palanduz, A., Yalçın, I., Tonguç, E., Güler, N., Öneş, Ü. & Salman, N., 2000, "Sonographic assessment of ceftriaxone‐associated biliary pseudolithiasis in children", Journal of Clinical Ultrasound, 28(4), 166-168. Palominos, R., Freer, J., Mondaca, M. & Mansilla, H., 2008, "Evidence for hole participation during the photocatalytic oxidation of the antibiotic flumequine", Journal of Photochemistry and Photobiology A: Chemistry, 193(2), 139-145. Parastar, S., Pooreshgh,Y. & Nasseri, S., 2013, "Investigation of photocatalytic removal of nitrate from aqueous solution using the ZnO / UV", Health and Enviroment Journal, 3(3), 54-61. Poulopoulos, S., Arvanitakis, F. & Philippopoulos, C., 2006, "Photochemical treatment of phenol aqueous solutions using ultraviolet radiation and hydrogen peroxide", Journal of Hazardous Materials, 8(1), 64-129. Rahmani, H., Gholami, M., Mahvi, A. & Alimohamadi, M., 2014, "Tinidazole removal from aqueous solution by sonolysis in the presence of hydrogen peroxide", Bulletin of Environmental Contamination and Toxicology, 92(3), 341-346. Ren, C., Yang, B., Wu, M., Xu, J., Fu, Z. & Guo,T., 2010, "Synthesis of Ag/ZnO nanorods array with enhanced photocatalytic performance", Journal of Hazardous Materials, 9(1), 123-182. Rodriguez-mozaz, S., 2015, "Occurance of antibiotics and antibiotics resistance genes in hospital and urban wastewaterand their impact on the reciving river", Water Research, 69(1), 234-242. Sayadi, M., Trivedy, R. & Pathak, R., 2010, "Pollution of pharmaceutical in environment", Journal of Industrial Pollution Control, 26(1), 89-94. Zamani, M., 2011, "4 antibiotics between 10 drugs with high use in Iran", Sepid Journal, 1(5), 2-3. Zhang, R., Zhang, G., Zheng, Q., Tang, J., Chen, Y. & Xu, W., 2012, "Occurrence and risks of antibiotics in the Laizhou Bay, China: Impacts of river discharge", Ecotoxicology and Environmental Safety, 80, 208-215. Zhang, R.,Tang, J., Li, J., Cheng, Z., Chaemfa, C. & Liu, D., 2013, "Occurrence and risks of antibiotics in the coastal aquatic environment of the Yellow Sea, North China", Science of the Total Environment, 450(3), 197-204. Zhang, T., Oyama,T., Aoshima, A., Hidaka, H., Zhao, J. & Serpone, N., 2001, "Photooxidative N-demethylation of methylene blue in aqueous TiO2 dispersions under UV irradiation", Journal of Photochemistry and Photobiology A: Chemistry, 140(2), 163-172.